1. A bag of intense ground coffee strong enough to wake the dead (aka, you). 2. Forto coffee shots for people who are just looking for a quick little kick of energy. 3. A Chemex pour-over glass to take your coffee obsession to the next level. Load this baby up with a filter, fill it with ground coffee, and then pour hot water into the top. Bam! Delicious coffee in its purest form. Price: $36.95+ (available in four sizes, with or without a handle). 4. A Ninja coffee bar for whipping up pretty much any amount of coffee your sleepy head needs. It can make lattes, iced drinks, single cups, whole pots, custom brew sizes, speciality brews, and more. Need some frothed milk? Yep, it's got you covered. 5. A simple, no-nonsense French press that gets the job done. The job being making delicious coffee that wakes you TF up before you have to go do your job. 6. A pajama set for people who need to see a cup of coffee the second they wake up. Promising review: "I was incredibly surprised with the quality of the printing. I was expecting the shirt to be silk screened and start to crack and peel after only a few washes. That is not the case at all, it's almost like the design is printed right into the fabric!" —Cristian H.
Price: $12.99 (available in sizes XS–XXL). 7. A mushroom coffee that tastes milder than regular coffee, and is said to help clear your head and make you more productive. Don't worry: It doesn't actually taste like mushrooms. The coffee comes in individual packets that you can mix with hot water (add some ghee or milk for a creamier taste). It tastes like a milder coffee and can provide a less intense energy boost without the jitters. See BuzzFeed's full review of this coffee. Price: $12.18+ for 10 (available in three types). 8. A practical percolator so you can be like Courtney Barnett and save $23 dollars a week on coffee. "Now we've got that percolator, never made a latte greater." 9. A pack of coffee-flavored Simply Gum to enjoy after a cup of actual coffee. 10. A stovetop moka maker that makes rich, dark coffee without any complications — reviewers say it's super easy to use. This can make three demitasse cups of moka (something in between coffee and espresso) in just a few minutes. Price: $16.99+ (available in five sizes). 11. A cult-favorite coffee scrub sure to make your skin feel as perky as you feel after your triple-espresso-shot-latte. I'm a big fan of this scrub! It smells good and makes my skin feel super soft. 12. A pod coffee maker that makes single servings of almost any brand you'd like with the help of refillable pods. This gadget has over 1,200 positive reviews! 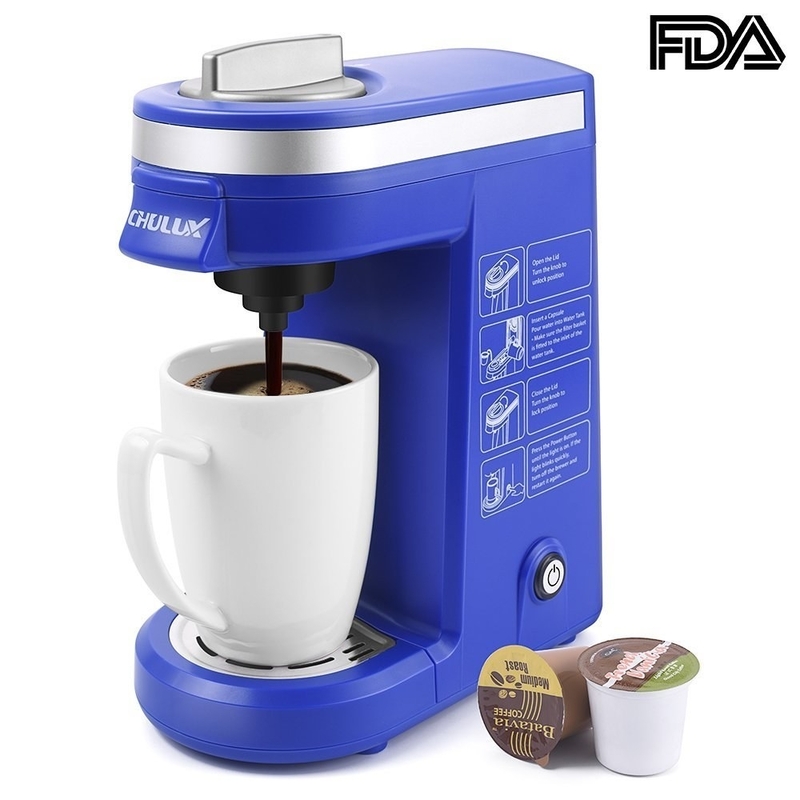 It fits most capsules and makes coffee in 3-5 minutes. If you use the refillable pods, you can enjoy any ground coffee you'd like. 13. Speaking of reusable items, a pair of cotton coffee filters that will help cut down on waste. You and Mother Earth will like them a latte. 14. A bag of Koffee Kult dark roast beans for coffee so good, it'll make your kitchen feel like a trendy new coffee shop. Promising review: "I am a coffee freak and always looking for the perfect cup of coffee. This dark roast delivered beyond my expectations, this was an absolutely excellent cup of coffee, one of the best I have ever had in fact and that is saying something. I am always in search of a 'better cup' and this is it. You won't be sorry if you try it. And it was roasted the day before it arrived at my house!!!" —Maria V.
15. A single serve coffee, latte, and cappuccino maker from Keurig for serving up frothy drinks with just a K-cup. 16. A Contigo travel mug that keeps your java hot for five hours, because being rushed is almost as bad as cold coffee. The button-operated lid closes when you're done drinking, so you don't have to worry about spills in the car. Promising review: "This is the best coffee mug I have ever owned. Bottom line: it lives up to its promise. I actually forgot this mug in my office before a meeting and when I came back for it six hours later the coffee was still STEAMING. Hot coffee is hot and this product is designed to keep it hot for a long time (which it does better than any other competing product I have tried in two decades). As for use... The, err, 'drinking slit' (sorry, unfamiliar with technical coffee kid nomenclature) is exactly the same shape and location as that on every take-out coffee lid everywhere on earth. It is a fairly intuitive process." —Shawn M.
17. Or a stainless steel travel mug with a handle, if you want something a little more rustic looking. 18. A trio of Ghirardelli squeeze bottles so you can have the appropriate amount of caramel in your coffee without having to hover over a poor Starbucks barista. It comes with chocolate, caramel, and white chocolate. 19. Insulated glass espresso mugs for feeling like you've transported to a little Parisian cafe every morning. They're made with borosilicate glass, which is stronger and more heat resistant than regular glass. Promising review: "We bought two of these glasses and liked them so much we bought two more. The glasses are just large enough for a 'lungo' with a dash of milk. The material and double insulation keep the coffee hotter than other mugs, especially after adding in milk." —Danny M.
20. A V-neck tee warning everyone about your intense, caffeine-fueled existence. 21. A travel espresso maker, because being on a mountain doesn't mean you have to sacrifice a good cup of Joe. This little gadget is compact and easy to travel with. It has a built-in cup and scoop. It's hand-operated, so you don't need electricity to use it. 22. 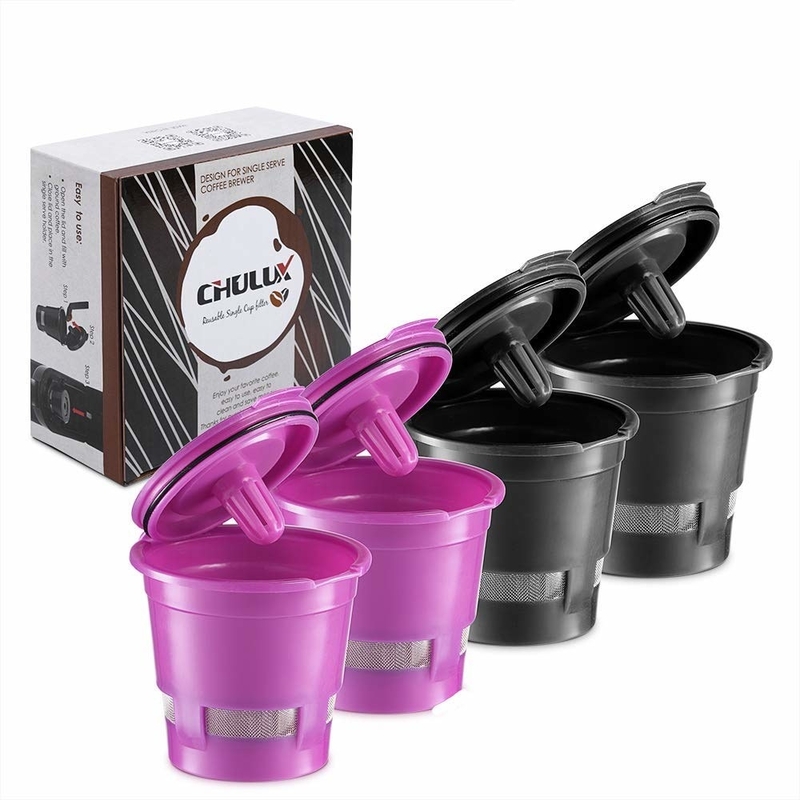 A container with a push-down top, so your coffee can stay fresh and airtight, no matter how much is left. 23. A spoon that clips on to the side of your coffee ground jar, so your scoop is never out of reach. And pick up a pair of mason jars! 24. An electric grinder with a safety lock for grinding beans for up to seven cups of coffee at a time. 25. And a hilarious mug to grab whenever you're vixen for a spot of coffee.